Alongside the huge collection of design resources available, Access All Areas members now also have a premium WordPress theme to download as part of their membership thanks to the kind people at Themely. 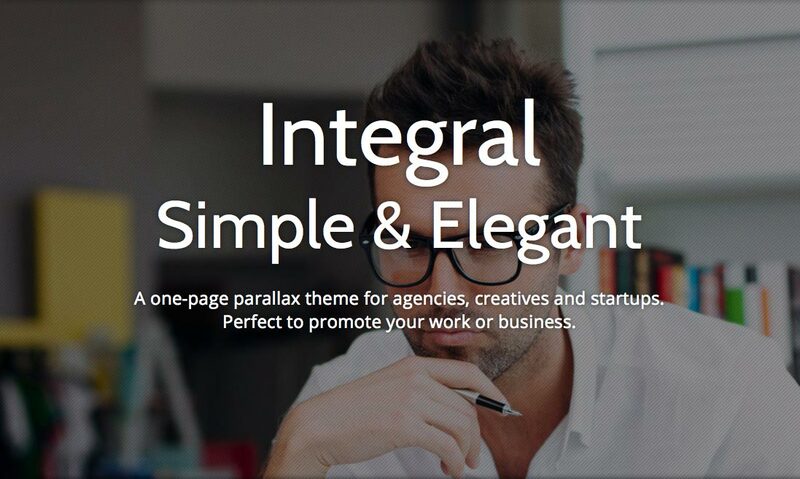 Integral Pro is a one-page parallax theme for freelancers, creatives and startups. Its simple and elegant design is perfect for promoting your work or business. It’s quick and easy to setup, allowing you to create a stunning website in minutes! Themely is a creatively agile group of designers and developers from around the global community, with their headquarters situated in downtown Montreal. They strive to create some of the finest WordPress themes in the market, while keeping them affordable and easy-to-use. Each theme is carefully handcrafted, uniquely tailored to meet your needs both now and for years to come. Integral Pro is a feature rich premium WordPress theme with a clean and modern design. It boasts an advanced theme options panel and drag & drop functionality that makes it easy to enable/disable sections and customise the content. Clever effects such as the parallax scrolling, Flexslider slideshows and lightbox popups make it a professional looking design that will wow potential clients and customers. Installation is easy too, with full documentation included to help you through the process. How cool is that! Thank you!